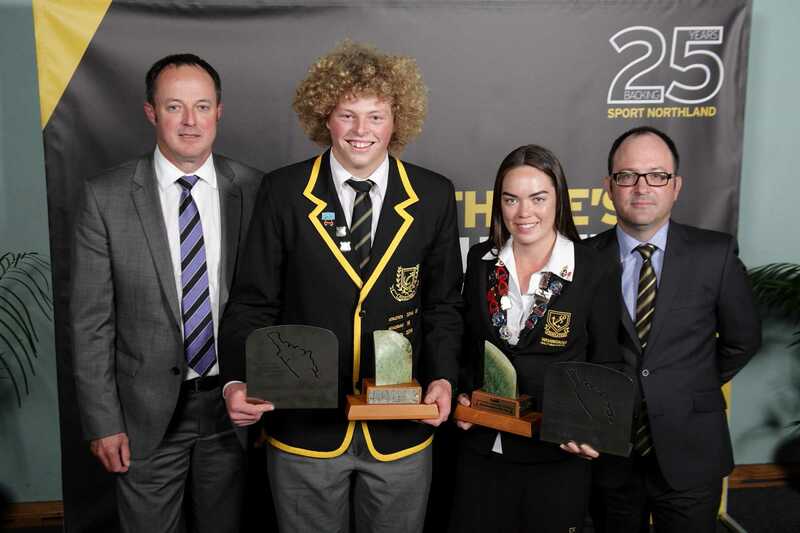 Whangarei Boys’ High School’s athletics and rugby star Scott Gregory, and Whangarei Girls’ High School’s top clay target shooter Caitlin Reed, took out top honours at the 25th annual ASB Northland Secondary Schools Sports Awards held at the ASB Stadium last night. Gregory, the ASB Northland Secondary Schools Sportsman of the Year has had a successful year in both athletics and rugby, taking the titles to the ASB Code Awards for both sports prior to the overall award. At this year’s National Athletics Championships Gregory won four gold medals in junior hammer throw, youth hammer throw, discus and shot put. To add to his collection he also won silver in the junior discus and bronze in the junior shotput. As well as the medals won in the athletics circle, Gregory also featured on the rugby field being named vice captain of the Northland under 18 team, became a member of the Auckland Blues under 18 squad and was selected and played for the New Zealand Secondary Schools team and the Barbarian’s team. Reed, the ASB Northland Secondary Schools Sportswoman of the Year, featured in the sport of clay target shooting where she competed as a member of the New Zealand Ladies Mackintosh team. To add to this honour, Reed was New Zealand’s highest overall junior triples champion and the North Island ladies highest overall minis champion. The ASB Sporting Excellence Awards for high performance in a sport not offered at secondary school level, both went to Kerikeri High School students – sportsman Kyle Chen for boxing and sportswoman Alex Edwards for spearfishing. As well as being the New Zealand junior boxing champion in his weight division, Chen is also the Taiwan National champion and the Australian National Open Gloves champion, while Edwards won the New Zealand under 16 spearfishing championships and was a member of the New Zealand Women’s team that won the Inter Pacific Championship. The Kerikeri High School Sailing team was named ASB Team of the Year for the second consecutive year for winning the New Zealand Secondary Schools teams sailing championships and, as part of the annual inter dominion competition, became one of three New Zealand schools at the inaugural Pacific Rim inter schools team sailing championships. New Zealand won the regatta and Kerikeri High School was placed fourth. The team members were Jack Bunce, Frankie Dair, Lewis Kidman, Francis Cassells, Emilie Jones, Amber Hookway, Maeve White and Chris Geerkens. The NorthTec Area Schools Awards were won by Shania Tatana from Broadwood Area School and Sam Mills from Tauraroa Area School who were both selected in New Zealand Area School teams . Just over 60 Northland Secondary School students from schools throughout the region were named as ASB Code Award winners. ASB Northland Regional Manager Glen Hardham had a wonderful time at the ASB Secondary School Sports Awards last night, acknowledging some of the region’s most talented young sportspeople and their achievements. “It’s always an honour and privilege to partake in the ASB Secondary School Sports Awards; the calibre of our region’s sporting talent is astounding. 2016 has been particularly exciting as we mark our 25-year partnership with Sport Northland. It’s great to see, year after year, our region’s youth excelling in so many areas of sport,” Mr Hardham says. This year marks 25 years of the Northland Secondary Schools Sports Awards, each year sponsored by ASB. To acknowledge ASB’s tremendous support over the 25 years, Sport Northland’s Chief Executive Brent Eastwood presented the bank with an engraved kauri plaque to honour the occasion. Glen Hardham was delighted to accept the award on ASB’s behalf. “ASB is proud of our ongoing relationship with Sport Northland, and pleased to see so many locals acknowledged at these awards throughout the years. I love Northland and the community of excellence fostered here, and it’s encouraging to see so many of our people achieving in all areas of sport. At ASB we foster a real passion for empowering young people, and as a nation full of sports fans we are proud to play a part in honouring our country’s up and coming sports stars,” Mr Hardham says. Eastwood also acknowledged the special efforts that the Regional Secondary School’s Sports Director Robyn Richards and her assistant Tamara Heremaia made in making the awards a memorable night. A book of 25 years of the ASB Northland Secondary School Sports Awards will be available for purchase shortly once the evening’s photos can be included. Previous winners of the ASB Sportsman and woman awards were invited with many attending including the first winner Sharna Tangira who cut the 25 year anniversary cake at a pre event function. The emcees for the night also featured former RadioWorks presenters who had emceed the awards a number of years ago - Chris Gregory who was the first emcee plus Mereana Hawthorn (Faulkner) who had lead proceedings on a number of occasions.